Please introduce the exhibition to our readers. The trade show IRAN STONE EXPO International Exhibition for Natural Stone takes place in Mahallat- Nimvar . This is the biggest stone show in Iran. The frequency of the trade show is annual. In 2016, more than 400 Exhibitors seized the trade show. 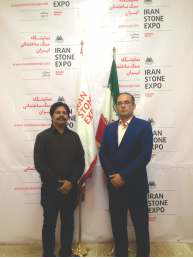 IRAN STONE EXPO as a presentation platform for their products and services. With their trade show participation exhibitors occupied 80,000 sq m area.15,000 sq m indoor area and 65,000 sq m outdoor area. 25,000 visitors attended IRAN STONE EXPO to inform themselves on innovations and trends in their business. More than 8,500 tonnes Blocks were displayed from 130 quarries of Iran and Afghanistan. If we compare the data of 2015 to 2016, there is increase of 15 % exhibitors and 30% exhibition area. What are the exhibited products during the exhibtion? The main exhibit sectors of the trade show IRAN STONE EXPO are: Display of Marble, Onyx, Limestone, Sandstone, Alabaster and Travonyx. Technologies, chemicals for stone care and preservation, grave monuments, restoration works, stone goods, artworks and souvenirs, facing products, natural stone in architecture, landscape design, interior design , town planning and heavy machinery. There are different zones dedicated to these categories. Is the region of Mahallat important for the stone industry? Nimvar / Mahallat located in the center of Iran.Nimvar / Mahallat importance in Iran and in the world is unchallenged as its supply volume represents close to 70 % of the whole Iranian in travertine stone cutting factories. Over 4,000 stone processing factories and 700 Quarries in its neighboring area. Over 400 Quarry contractors inside the Nimvar/ Mahallat and over 2,000 Quarry contractors in all over Iran. What are the future prospects for the exhibition? We want the exhibition to be in top 5 stone fairs in the world.Now that the sanctions are removed, the world is looking at Iran for business. The next edition will be the 10th edition for us. We look forward for more 25,000 sq m indoor space, by building new halls. Also, more international participants by adding international pavillions. We would like to invite visitors, exhibitors , stone associations from around the world.